Spring green background with orange eyed and toed tree frogs. 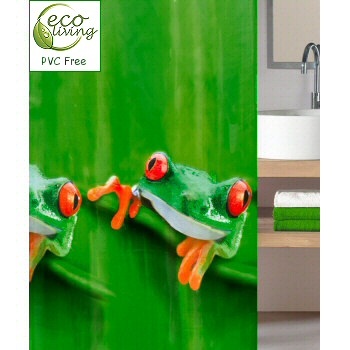 The frogs are spring green and a darker green and are 24in in height gripping a leaf vein on the lower half of the shower curtain. The tree frogs repeat across the lower half of the shower curtain.